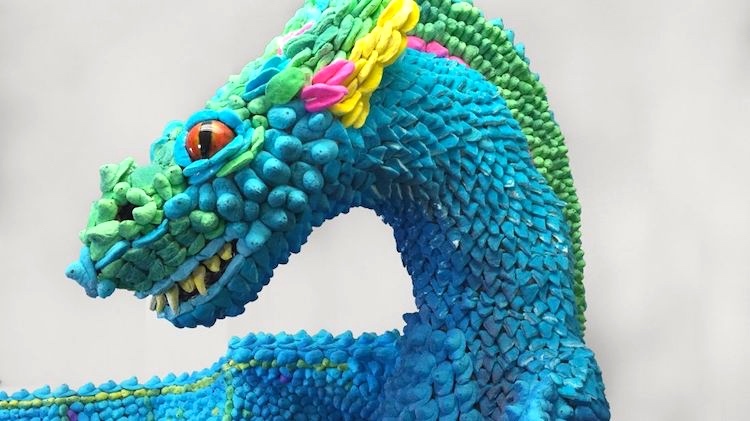 As part of this year’s PEEPshow — an annual Peeps-themed event in Westminster, Maryland — artist Vivian Davis (who’s on Instagram as @tutoringart) constructed a Game of Thrones-themed dragon sculpture out of 5000 marshmallow Peeps. The dragon has her wings outstretched, with a nest of colorful eggs in front of her. It’s not quite life-sized, but it is massive — the candy model measures 8.5 feet tall, with a 7-foot wingspan. For comparison, Gwendoline Christie, who plays Brienne of Tarth, is 6 feet, 3 inches (or 75 Peeps chicks) tall. The Komodo dragon (Varanus komodoensis), also known as the Komodo monitor, is a species of lizard found in the Indonesian islands of Komodo, Rinca, Flores, and Gili Motang. A member of the monitor lizard family Varanidae, it is the largest living species of lizard, growing to a maximum length of 3 metres (10 ft) in rare cases and weighing up to approximately 70 kilograms (150 lb). … As a result of their size, these lizards dominate the ecosystems in which they live. 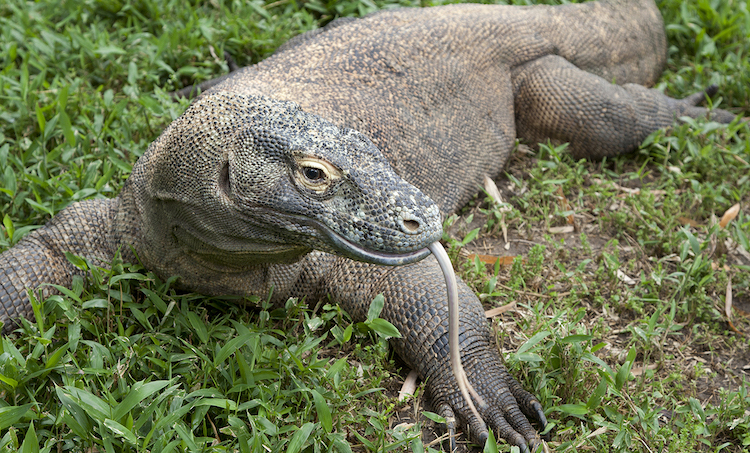 Komodo dragons hunt and ambush prey including invertebrates, birds, and mammals. It has been claimed that they have a venomous bite; there are two glands in the lower jaw which secrete several toxic proteins. The biological significance of these proteins is disputed, but the glands have been shown to secrete an anticoagulant. 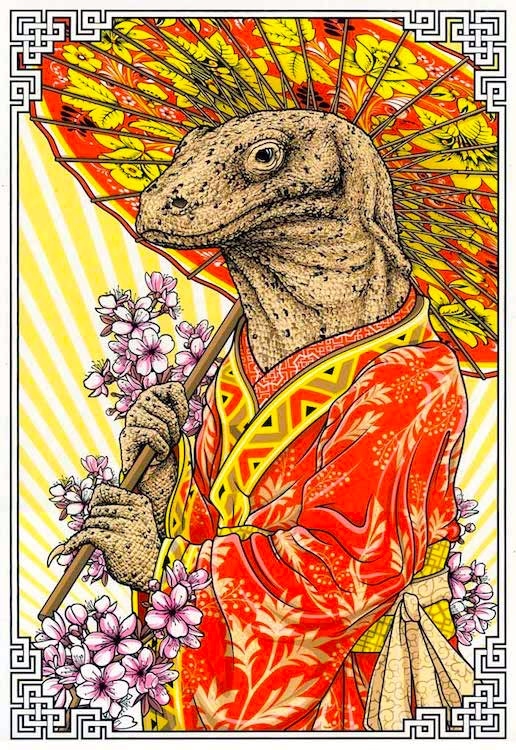 [artist’s commentary:] A pun-based piece that plays around with the idea of a Komodo dragon, wearing a traditional kimono. In this piece, I embraced some traditional Japanese iconography, and fused it together with the idea of a Komodo dragon. This project created numerous obstacles along the way and was a true pain to bring to completion. One of my favorite and least favorite parts of the image was working with the creature’s scales. A happi (法被, 半被) is a traditional Japanese straight-sleeved coat usually made of indigo or brown cotton and imprinted with a distinctive mon (crest). They are usually worn only to festivals. Originally these represented the crest of a family, as happi were worn by house servants. Later, the coats commonly began to display the crests of shops and organizations. Firefighters in the past also used to wear happi; the symbol on their backs referred to the group with which they were associated. In English, happi is most often translated as “happi coat” or “happy coat”. … The popular western image of a dragon as winged, four-legged, and capable of breathing fire is an invention of the High Middle Ages based on a conflation of earlier dragons from different traditions. In western cultures, dragons are portrayed as monsters to be tamed or overcome, usually by saints or culture heroes, as in the popular legend of Saint George and the Dragon. They are often said to have ravenous appetites and to live in caves, where they hoard treasure. These dragons appear frequently in western fantasy literature, including The Hobbit by J. R. R. Tolkien, the Harry Potter series by J. K. Rowling, and A Song of Ice and Fire by George R. R. Martin. 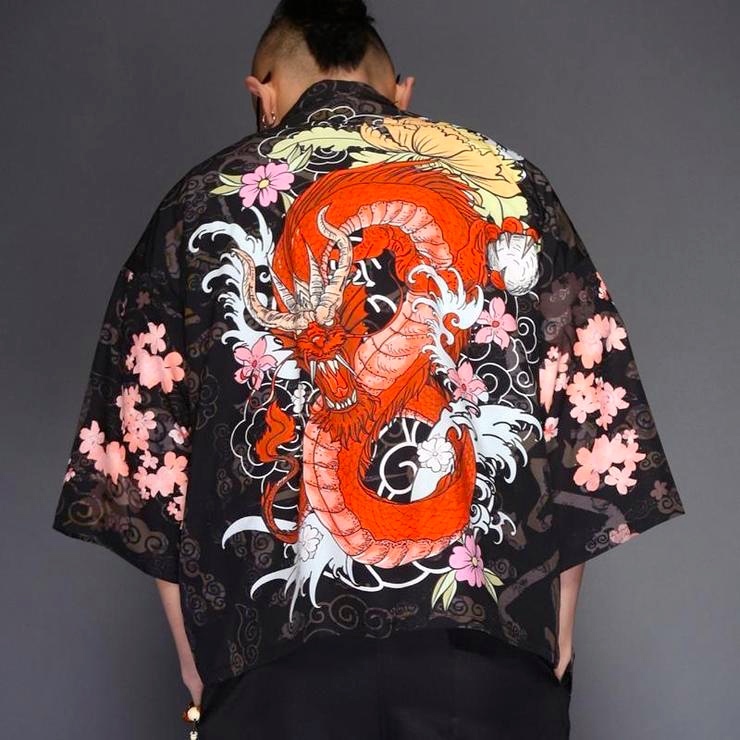 The word “dragon” has also come to be applied to the Chinese lung (龍, Pinyin long), which are associated with good fortune and are thought to have power over rain. Dragons and their associations with rain are the source of the Chinese customs of dragon dancing and dragon boat racing. Theropods are generally carnivorous; the group includes the familiar dinosaurs Tyrannosaurus and Velociraptor. 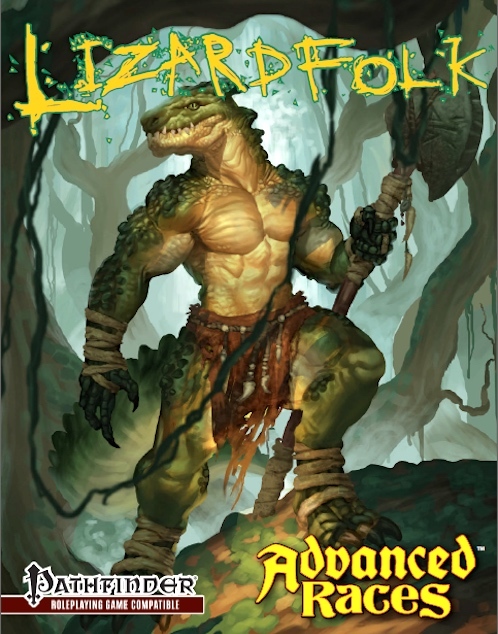 The lizardfolk are an ancient people with a storied past and traditions untroubled by the passage of time. Their strength is hidden, their teeth and claws sheathed until the moment is right. Sobek (also called Sebek, Sochet, Sobk, and Sobki), in Greek, Suchos (Σοῦχος) and from Latin Suchus, was an ancient Egyptian deity with a complex and fluid nature. He is associated with the Nile crocodile or the West African crocodile and is represented either in its form or as a human with a crocodile head. Sobek was also associated with pharaonic power, fertility, and military prowess, but served additionally as a protective deity with apotropaic qualities [averting evil influences or bad luck], invoked particularly for protection against the dangers presented by the Nile. 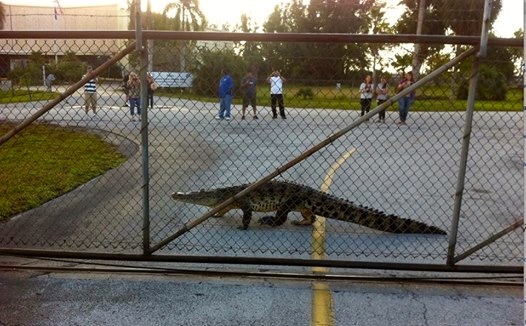 In the real world, crocodiles are notoriously testy and aggressive. This entry was posted on April 11, 2019 at 12:02 pm and is filed under Books, Clothing, Compounds, Language and animals, Language and food, Movies and tv, Puns, Toys and games. You can follow any responses to this entry through the RSS 2.0 feed. You can leave a response, or trackback from your own site. The American crocodile is far less aggressive than the others. We have a nice family where I work. We just make sure we don’t step on them, and we’re fine. 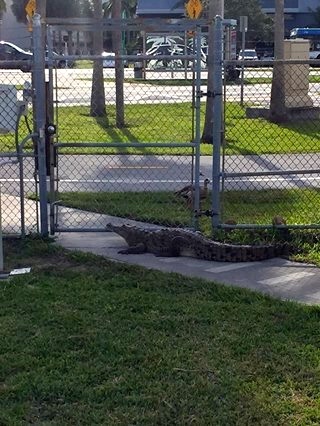 They keep the iguana population down. Posting pictures (and italics, bold-face, blockquote text, etc. ): use html formatting.